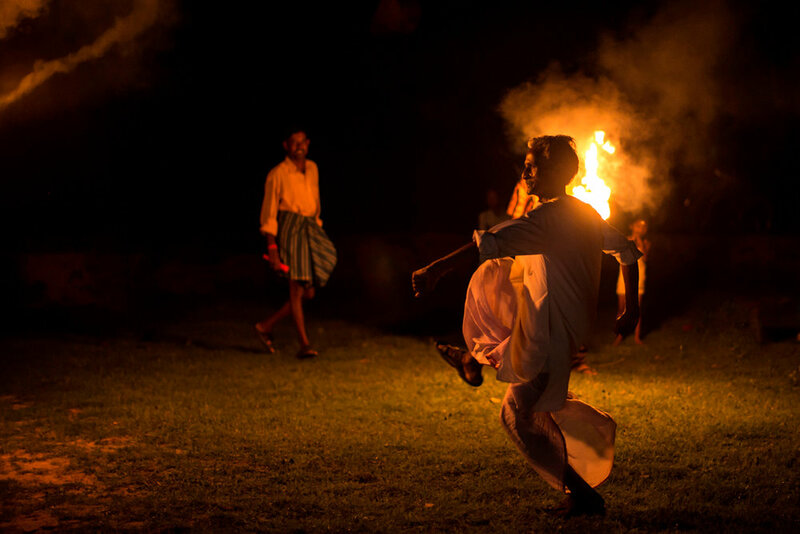 The Chhau Dance originates in the Purulia district in West Bengal and draws inspiration from martial arts and combative training. This form of dance is a means to portray stories to the audience, which is why elaborate masks and headgear associated with battle and war are worn during the performance. The story itself revolves around the two great epics of Indian Mythology – Ramayana and Mahabharata. Over a century old, this dance form was widely endorsed by patrons belonging to the royal families, rich landlords and British governors in the region. The masks worn during this performance are of vital importance as they are used to convey emotions and the nature of the character. Popular and highly commended for creating some of the best masks in the State, Chorida is a village that these performers have come to rely on for their masks. All members of a household are involved in creating these masks, whether that translates to procuring clay, painting, drying or decorating these masks.ASIAN PAINTS Colour Journey in partnership with UNTOLD collective We at UNTOLD collective explore the world of two generations of CHHAU in partnership with ASIAN PAINTS Colour Journey. Nepal Chandra Sutradhar is a craftsman turned performer, the past, the master. Nepal walks barefoot across his humble home. You see Chhau masks of every character from the Mahabharata and the Ramayana adorned on the walls all around his house, as he thinks about the performance he is choreographing that evening. He picks a mask, puts it on and immediately gets into character. He is too old to perform now, but he orchestrates every performance in the village. And he always begins by getting into character himself.Manoranjan was a dancer too at one time, but it was his incredible skill at making these Chhau masks that made Nepal ask him to pursue just the craft as a profession. He not only learnt every little tradition from Nepal, but he also keeps pushing to evolve this intricate craft. As Nepal brings his dancers together and Manoranjan carefully puts together the pieces of the grand mask, the whole village starts preparing for the evening by donning their favourite Chhau masks and watching by the sidelines. It is a clash of two worlds when Nepal walks into Manoranjan’s workshop. One, an expressive easily curious man and the other being calm and focussed. The Chhau masks in itself are an essential mix of calm and chaos. The eyes and expressions are sometimes in a rage and when they are in that state, the decorative elements above the face turn into a composed moment. The maker and his master are constantly shifting these roles. All the actors of the play make their way across the Chorida village. They don their costumes with pride and walk to the farm, which will be the venue. A crowd reaches from every edge of the village in grand excitement. The musicians sit on the edge of the invisible square and the moment the drumbeat starts, the performance begins. 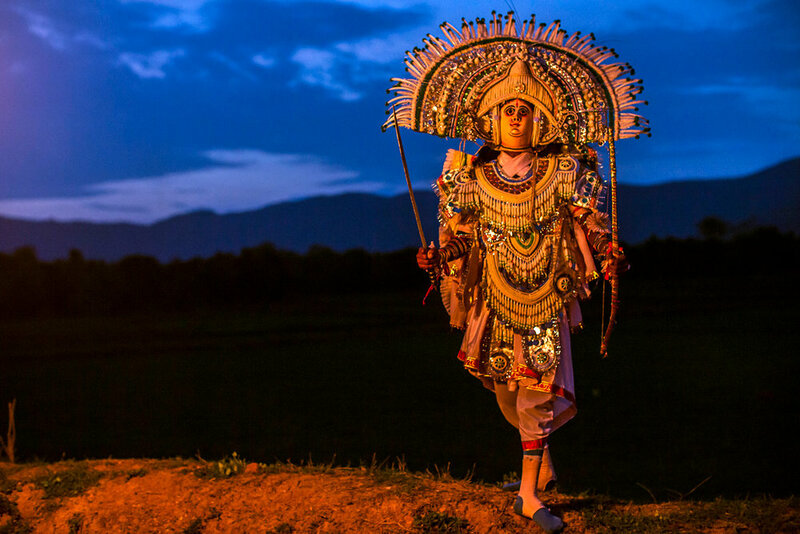 Dusk turns to night as the epic characters of the Mahabharata come to life. After a successful performance, the maker and his master stroll through the fields discussing their next act together. It doesn’t take them long before they both find themselves in a dance and walk alongside each other in character, finding expression together like no other.